Cutting speed about 15-20sec for 60. With hydraulic system, cutting speed is adjustable and stable. The motor is 7.5HP, and cutting is 90. The cool water can be recycled. Best cutting for SUJ2, stainless S45C and other heat treatment steel. It is suitable for long material or sample cutting. Water cooling can reduce the cutting powder efficiently. 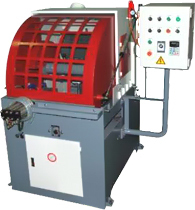 Speed cutting with high rigidity but burning and reduce the power produced.